If your image of someone who does origami is a little Japanese girl making paper cranes, you’re way out of date. 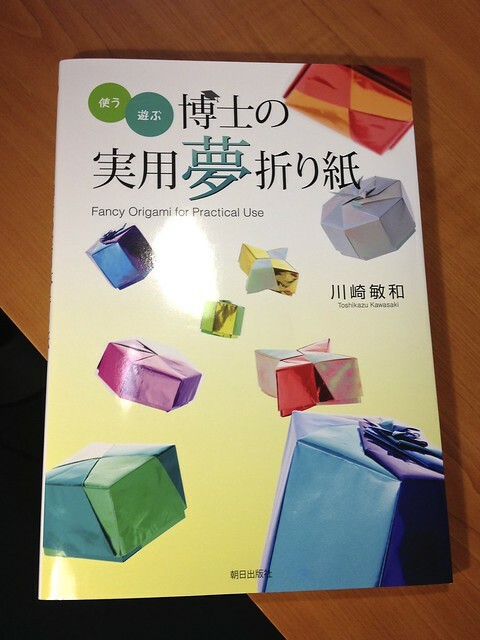 Alright, I confess, I was too, until I went to a talk and demonstration at the Japan Foundation by the world’s first Doctor of Origami, Toshikazu Kawasaki, and discovered that nowadays origami is a branch of geometry. Dr Kawasaki is an entertaining speaker, his topics ranging from whiskey (he loves it) to the navigation signs in the British Museum (he hates them – they’re a recipe for confusion, he says). He spends ten hours a day doing origami, and often misses his stop because he’s doing origami on the bus. 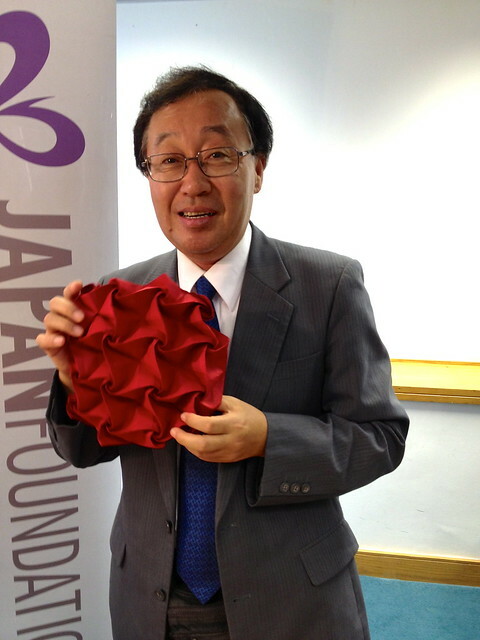 He plunged us into the world of origami by demonstrating the famous Kawasaki Rose. Try Googling it and see how many hits come up – ‘more than David Beckham gets’, as he pointed out with some pride. With four basic folds and an expert twist he turned a piece of origami paper into this in less than a minute. So where does the maths come in? Well, Dr Kawasaki gave us a brief introduction to Kawasaki’s Theorem. 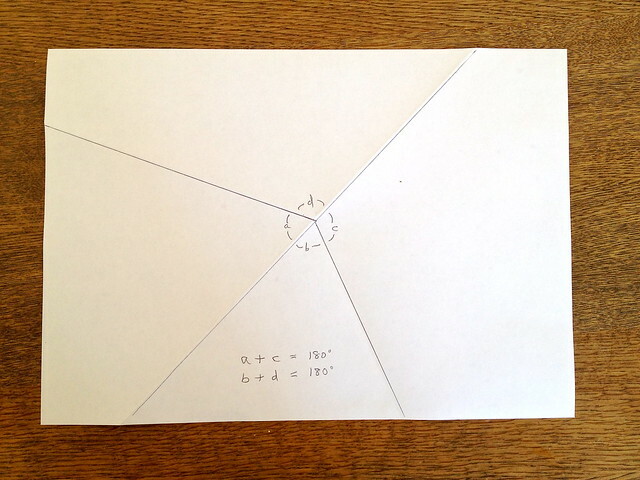 He didn’t take us through the detail (it’s on Wiki if you’re interested) but, by getting us to make a few simple folds in an ordinary piece of paper, showed that the alternate angles in an arbitrary crease pattern always add up to 180 degrees. Which not only proves a geometric theorem but shows you can make a paper crane out of the oddest shapes. Dr Kawasaki is a lecturer at Anan National College of Technology in Tokushima, where he teaches maths to engineering students. 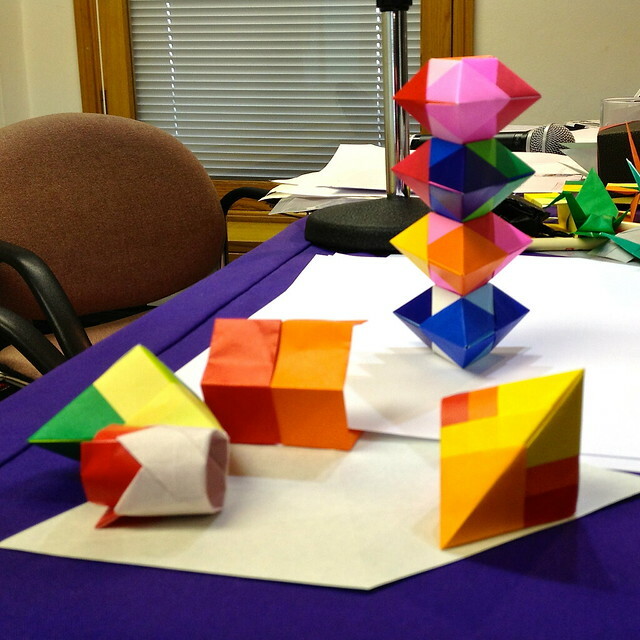 One of the ways in which he uses origami is to teach the difference between the virtual planes in mathematics and the real world. This tower of triangles can theoretically be built to any height; but in practice once you get past ten or so the lowest triangle collapses under the weight. He also made some interesting comments about the way people use the different colours on each side of origami paper to guide what they do instead of following the shapes. 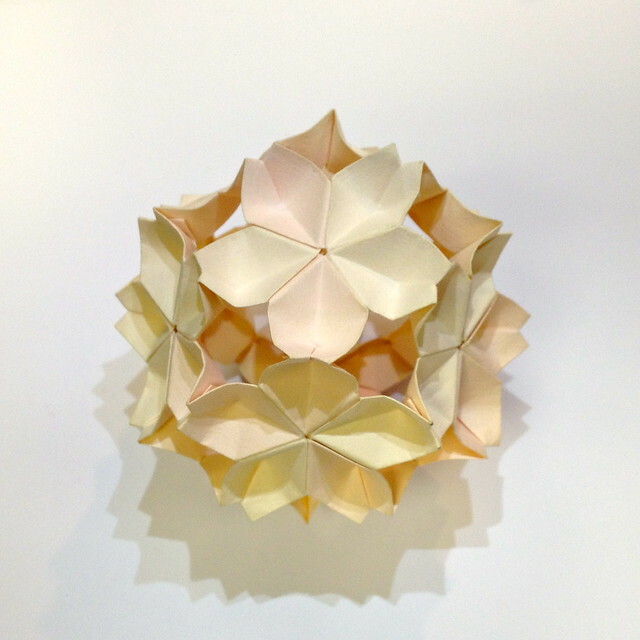 In some of his origami he gets his students to use paper that is the same colour on both sides to avoid colour-led mistakes. Origami nowadays is becoming increasingly complex. 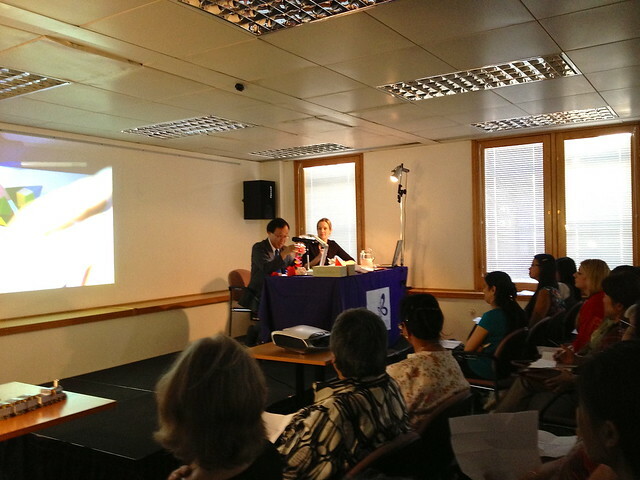 Dr Kawasaki showed us a beautiful cherry blossom ball, which he said he had made for Princess Masako. 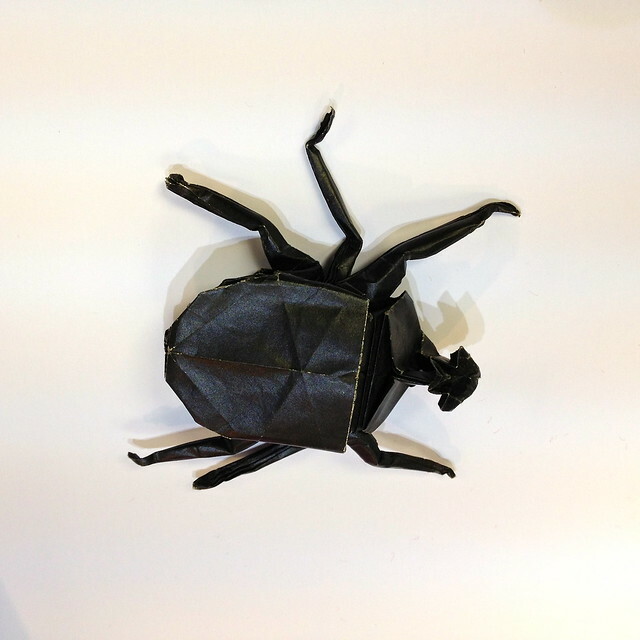 But he bemoaned the fact that boys concentrate on making origami of their favourite anime characters while young men are only interested in complex origami, like this beetle. I’m not sure how many people in the audience were interested in using origami to solve geometric problems not susceptible to compass and straight-edge solutions. But they hung on his every word, and mobbed him afterwards, frustrated that his new book, subtitled in English as Fancy Origami for Practical Use, is not yet published. The Japan Foundation had originally planned one talk, but had to add another one due to the demand. 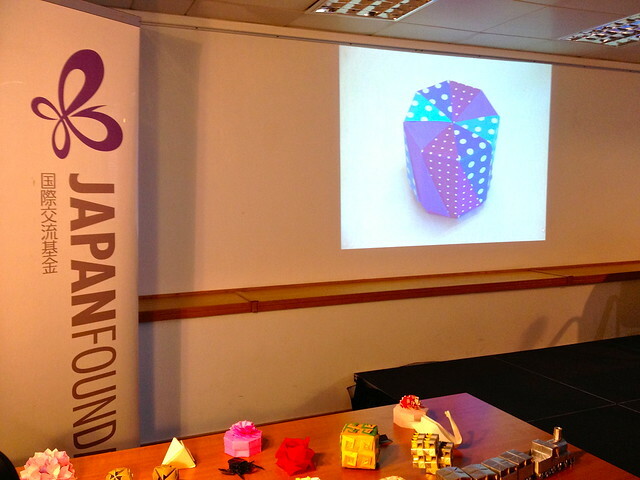 If you want to see Dr Kawasaki in action, he’ll be speaking at the British Origami Society’s autumn convention in Edinburgh (31st August – 1st September). 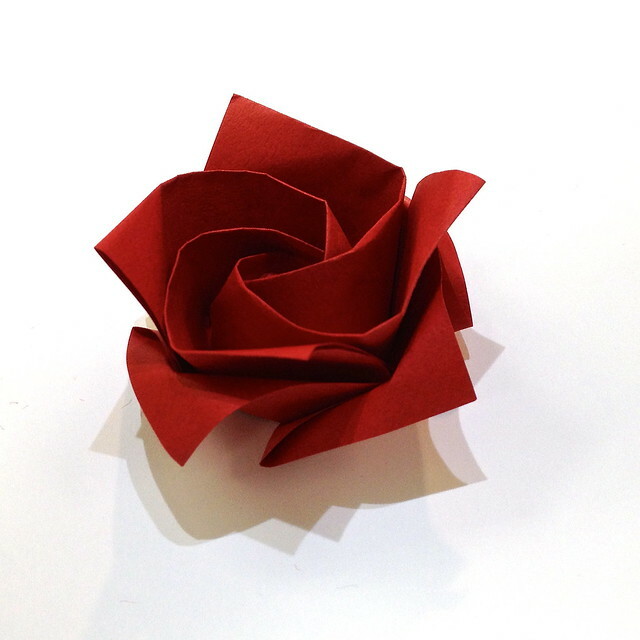 This entry was posted in Craft and tagged arts, Dr Kawasaki, Japan Foundation, Kawasaki's Rose, Kawasaki's Theorem, London, origami by Fran. Bookmark the permalink. Fascinating – and I feel oddly ignorant that I didn’t know there was as British Origami Society, and that it is big enough for a convention. Me neither – but I’ve now added a link to their home page. I went too! Were you at the 3pm or the 6.30pm talk? 3pm. Were you the textile artist who asked a question? I did wonder – but then it was such chaos at the end I couldn’t follow it up. Oh well, next time! 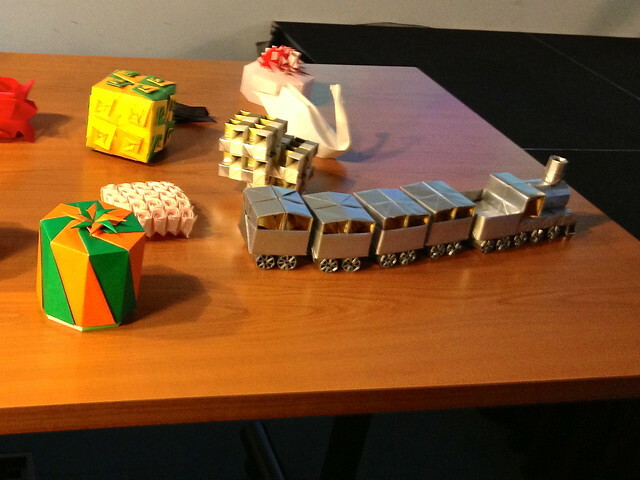 Yes, I have a new respect for origami now. I’ll have to look out for more events. Glad you liked it – thanks for dropping by! I have friends who love origami (I do too, but I’m pretty hopeless at it) and are always amazing us with new folds & designs. Such an interesting topic! I can just about fold a basic crane. But do get your friends to try the Kawasaki Rose – there are loads of videos on YouTube showing you how it’s done. Super interesting stuff! I shall try a Kawasaki Rose this weekend. Good luck! It looked incredibly simple when he did it, but then he’s had a lot of practice!